The park is situated at the Southeastern edge of the capital and cavers an area of 840 hectares. A forestation began in 1904 with the planting of various forest species, mainly from abroad. Over 500 trees, shrubs and herbs have been recorded in the area, 12 of which are endemic. At Athalassa N.F.P. a network of trails has been created covering 20 kms. Starting Point: Two parking lots. The trail goes round the banks of the small reservoir of the same name. Points of interest: Picnic area and reservoir. Starting point: A point on the south side of the Agios Georgios reservoir. Points of interest: A route among pine, eucalyptus trees, cypresses and acacias. A picnic area next to Athalassa reservoir with volleyball and basketball courts. Points of interest: A walk around the reservoir. Observation point for hybrid birds. Points of interest: Park of Nations where Foreign Heads of States visiting Cyprus plant trees in remembrance of their visits. 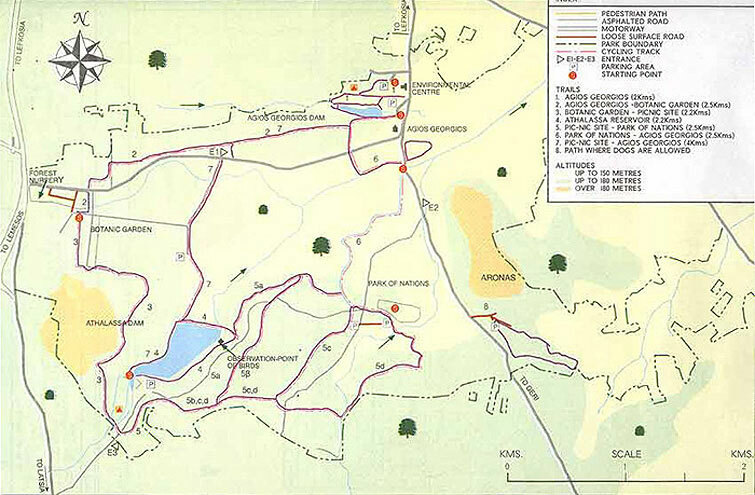 The 6 walks described above are part of a circular walk, the starting point of which is either the Agios Georgios picnic area, or that at the SE entrance near Latsia. Length: 10.5 kms Time: 4 hours. The two picnic areas are linked by a third walk, which goes past the Athalassa reservoir and entrance 1. Note: Dogs are allowed only on a 1.5 km path, built specially for this purpase. The path is situated to the left of the Aglantzia - Geri road.